Truth be known, I do not run a Thanksgiving race. It's just too darn hard for me to fit in a race in the morning - travel time, run, wait, travel back home - then run around the house like made to get ready for the big Turkey day festivities. So, Jill and I decided we'll have our own Family 5k in the morning. Virtually no travel, run with awesome people, and then we're home again in no time. Win win! The plan is that all 8 of us will meet and we'll run. If the boys don't feel up to running, then they can ride their bikes and of course the girls will be in their joggers. I mean, our Family 5K isn't an official race, so it still counts, right? What are your Thanksgiving running plans? Running any races? If you aren't, you should consider heading over here to sign up for the virtual 5k. Oh and if you haven't entered my Handful contest - scoot right over here and do it! Contest ends tomorrow. I'll be choosing a winner using Random.org this weekend. 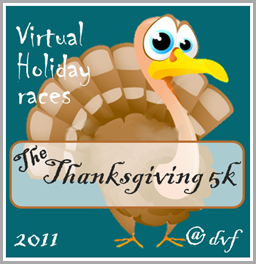 Hmmmm - maybe I'll sign up for "the Thanksgiving 5K" I can never get it together for a real organized race but maybe a virtual one would work! That's what I love about virtual races - they are super accommodating. We can do them anywhere and squeeze it in anytime. Very cool! I like this! I am actually walking a Turkey Trot 5k for the first time ever on Thanksgiving morning. We are getting a big group together to walk it. Even though I'm not running I'm excited to the race with my friends and family.